Today’s supermarket shelves are piled high with intensively farmed fast growing continental breed beef, fed on concentrated feed to rush them to maturity then the meat is rushed onto the shelves with little or no carcass ageing, frequently resulting in a bland unsatisfying eating experience. 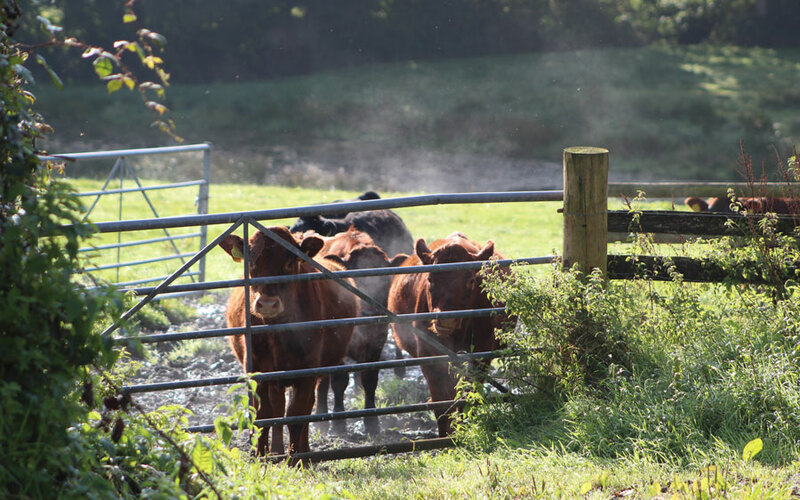 Here at Hallwood Farm although there was a temptation to go with the flow and stock the land with these fast growing super beef breeds, we wanted to produce something a little different, more suited to our land and our farming ethos of ‘flavour and quality before yield’. The claims made about the superiority of quality and health benefits of beef produced on grass fed, low intensity systems abounds on the internet. All of this and a desire to do what is right for our beautiful North Devon mixed farm was taken into account when we set off on our journey to produce something a little special. We opted for a Jersey crossed with a Ruby Red Devon. The Jersey, a traditional dairy breed although having a low carcass yield does have outstanding meat qualities. The Ruby Red Devon are a docile local breed which respond well to gentle handling, give a good frame and fatten well on our herb rich pasture, they are if you like ‘designed’ to thrive in this specific region on our native meadow species. Being a dairy breed these calves would be a bi-product of the milk industry and would normally be shot at about a week old, just as soon as their passports arrive from DEFRA. Buying these calves provides our neighbouring dairy farm with some very welcome additional income, saves some lovely young beasts from a wasted short life and gives us a very special cross breed which if reared with care provides the most wonderful beef imaginable – a no brainer really! The small batches of calves arrive with us at about a week old. They are bucket fed milk for 8 weeks, are offered ad lib our own homemade hay and a homemade mix of rolled barley, sugar beet pellets, flaked maize, soya & minerals. Then at about 18 weeks they are turned out to graze. From this point they will only eat grass or grass silage made here on our farm for the rest of their lives. 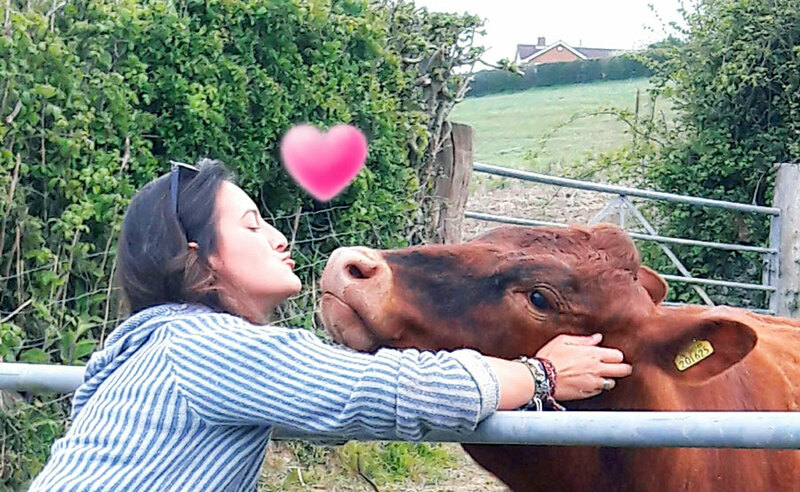 Compared to intensively farmed beef, which is ready to kill in just 12 to 18 months our animals stay here on this farm for 28 to 30 months until they are ‘finished’. Thankfully we do still have local abattoirs where we can send our animals without subjecting them to long arduous journeys. However, sadly there is a trend for the smaller family run slaughterhouses to close when they cannot afford to compete with the big boys or make the huge necessary capital improvements necessary to keep up with current legislation. Our meat is well hung and then skilfully butchered by a talented local village butcher. Now 10 years into the Hallwood Jersey cross beef herd we have a loyal beef customer base eagerly awaiting each batch of this very special meat. 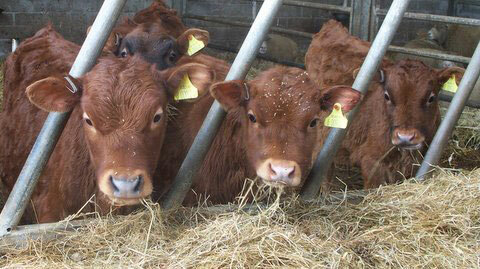 Jersey cross Ruby Red Devon beef must certainly be a case where ‘less is very definitely more’!